NETWORK UPDATE: ABC’s numbers came down after the Dallas airing of MONDAY NIGHT FOOTBALL was removed, with DANCING WITH THE STARS reduced by 0.2, and CASTLE by 0.3. On CBS, 2 BROKE GIRLS held its morning number, but THE MILLERS lost 0.1 to a still lower series low 1.7; however, SCORPION gained 0.1. The Taylor Swift-boosted episode of THE VOICE was up 0.1, while THE BLACKLIST fell by the same amount. MONDAY NIGHT FOOTBALL was up an enormous 2.04 from last week for the Dallas/Washington showdown, giving the telecast a giant 6.89 rating. USA and VH1 divided the rest of the night’s spoils. USA’s WWE was at 1.16-1.28 over its 3 hours (very close to last week), and the network got a solid tune-in 0f 0.71 for a “sneak peek” of tonight’s premiere sitcom BENCHED. VH1 followed LOVE & HIP-HOP HOLLYWOOD (up 0.06 to 1.27) with the original movie DRUMLINE: A NEW BEAT, very strong at 1.10. FAST N LOUD (Discovery) was off a tick at 0.75, but MISFIT GARAGE followed it by dropping 0.21 to 0.48. AMERICAN DAD (TBS) fell 0.06 to 0.61. THE DAILY SHOW (Comedy) returned from a week off with the first of 4 nights taped in Austin, Texas, and was at 0.57, with THE COLBERT REPORT at 0.46. 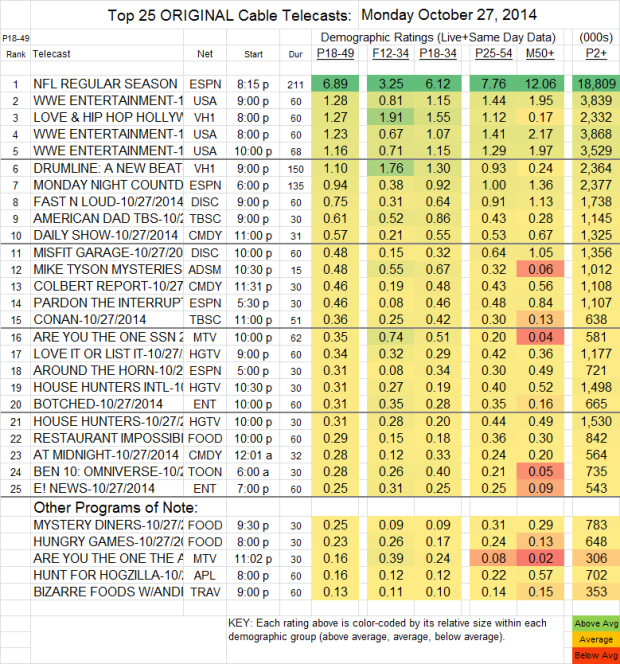 MIKE TYSON MYSTERIES (Adult Swim) debuted at 0.48, with another 0.37 for its 2AM replay. MTV’s 2 episodes of ARE YOU THE ONE? were at 0.35/0.16, down 0.04/0.08 from last week.